Dr. Derek Cavatorta, researcher in equine immunology, needed to show the relationship between dendritic cell maturation and regional lymph anatomy. We developed a series of color illustrations to solve his problem. 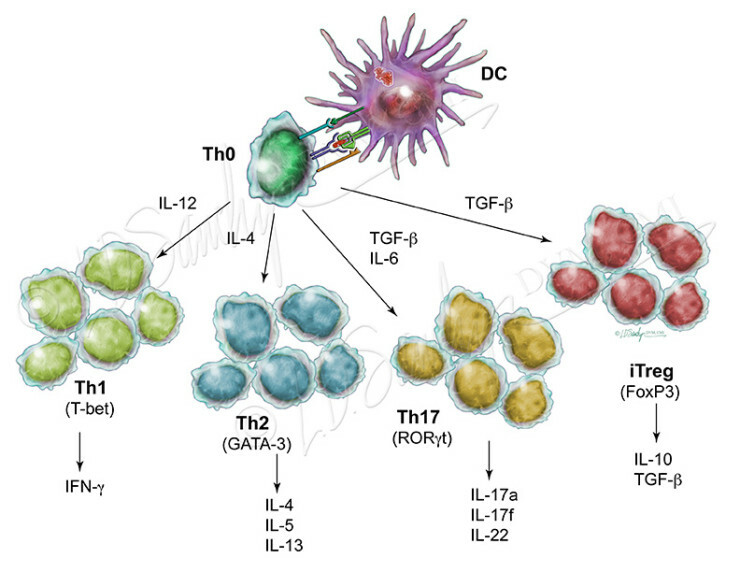 This didactic piece shows that, depending on the dendritic cell maturation state and the local cytokine environment, activated T cells can acquire a variety of phenotypes. Th1 cells are important for immunity to intracellular pathogens and tumors; Th2 cells promote antibody production, help prevent parasitic disease, and are involved in allergic response; T17 cells protect against extracellular bacteria, and iTreg cells help control effector T cell responses and prevent immune-mediated disease.